Insulation testing at voltages above 1 kV can be a quick and convenient way of gathering a lot of useful information about the condition of electrical equipment. To stay safe and to get the best results, however, it is important that the testing is carried out correctly. These tips should help, but remember that it’s always essential to follow the manufacturer’s instructions for the test set that’s being used, to abide by the relevant standards and to follow good working practices. 1. Use the right test leads. Manufacturers of insulation resistance testers go to a lot of trouble to produce test lead sets that will help make their instruments safe and convenient to use. Always use a lead set that’s designed for the instrument, appropriate for the test voltage you’re planning to use and suitable for the test object you’re working on. If the connections can’t be made securely, the test lead may become accidentally disconnected, leaving the test object charged to a dangerously high voltage. Never ever use test leads that show any sign of damage and never attempt to repair damaged or worn leads – replacing them is the only safe option. 2. Choose the best test voltage. Test sets are now available that will allow testing to be carried out at voltages up to 15 kV. Testing at higher voltages can yield additional and more useful information about the condition of the test object’s insulation, but using a voltage that’s too high for a particular test object to withstand can seriously damage it. Always refer to the supplier’s data for the object under test and follow the guidance it contains on testing. If this isn’t possible, seek help from the manufacturer of your insulation tester. 3. Choose the right test. A quick one-off insulation resistance measurement can sometimes provide useful data, but modern insulation resistance test sets have much more to offer. Typically, they offer facilities for polarisation index (PI), dielectric absorption ratio (DAR), dielectric displacement (DD), step voltage (SV) and ramp tests. Full information on these tests and how to carry them out should be in your instrument’s handbook – if it isn’t consult the manufacturer. Some of these more advanced tests take a little longer to perform but, with many kinds of test object, they can provide much more reliable information about insulation condition. 4. Use an instrument with a high measuring range. If your instrument shows all results above, say, 1 TΩ as infinity, you’ve got no way of knowing that the insulation resistance of your test object has fallen from 30 TΩ to 2 TΩ since the last time you tested it. This latest result might still fall within the range that’s considered acceptable for the test object, but a big fall in resistance value like this is often a valuable early warning that a problem is developing. An instrument with a high measuring range will alert you to this situation. 5. Complete the test before disconnecting the test set. Test objects can hold a lot of charge and, particularly when they’re being tested at high voltages, the stored charge can be lethal. Modern testers guard against this problem by safely discharging the test object when the test has run to completion or when it is terminated by the user. If the test leads are disconnected prematurely, however, the discharge function can’t operate, and the test object will remain charged – and dangerous. 6. Use the guard terminal. Surface leakage over test objects like bushings can greatly reduce their apparent insulation resistance and, as a result, there have been many cases of insulators being scrapped when all that was really necessary was to clean them. 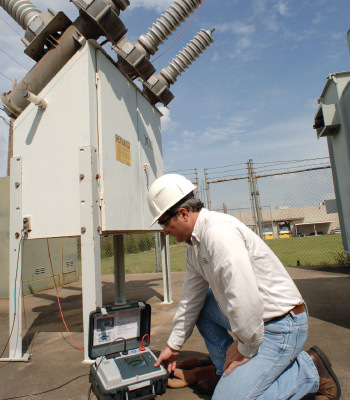 Using the test set’s guard terminal – which is usually connected to a bare wire wrapped around the surface of the object under test – eliminates or at least greatly reduces the effect of surface leakage on the test results. And don’t forget that making two measurements, one with the guard terminal connected and one without, can provide a very good indication of whether or not the insulator needs cleaning. 7. Record and trend your results. A single insulation resistance measurement can give you a quick indication of insulation condition, but a series of measurements over a period of time, with the results recorded and trended, will tell you a lot more. If the insulation resistance of your test object is declining over time, for example, it’s probably a good idea to find out why, well before it declines to the point of failure. Accurate records will also quickly show up any sudden deviation from the usual insulation resistance values, which is always a strong indication that further investigation is necessary. For additional information that will help you to get the best from the time and money you invest in high-voltage insulation testing, download the free application guide to insulation testing above 1 kV.